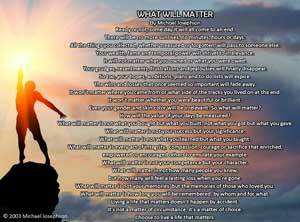 Living a Life That Matters ANNOUNCEMENT: Who Gets to Go to Lunch? Please vote. When my radio commentaries were canceled by KNX, a radio station in Los Angeles, listeners were invited to write short essays on what the commentaries have meant to them. The authors of the top five essays will be invited to a special lunch. I was amazed to receive 76 essays — all personally moving. I loved them all and couldn’t pick so our staff selected the top 10 “finalists” and set a voting process for the readers of this blog. If you want to help, or just read the nice things people had to say, please visit our Contest Page.